A few weeks back while we were at Gymboree shopping, I noticed all the Halloween stuff was out. Whats next, Christmas in July? At any rate, they did have some super cute stuff out (although I may be biased cause I love them) and one of them was this totally cutetastic witches broom made of tulle. Of course the only daughter I have in this house that could be a witch is FAR too tall for the tiny broom they had, so I set to work to make her one of her own! To do this craft yourself, you are going to need a few things. 3 assortments of tulle, 6 inch on spools (Hobby Lobby sells it for pretty cheap). I bought the sparkly kind in black, purple, and green. (optional) misc decorator items for the end, sparkles, fake spiders, etc. Step 1: First I wrapped my dowel with one satin ribbon. Its really easy to dab some hot glue on the top and then start wrapping. If you twirl the towel as you go, the ribbon should wrap up perfectly. I made sure I hot glued it every 4-5 turns so it would stay put well. 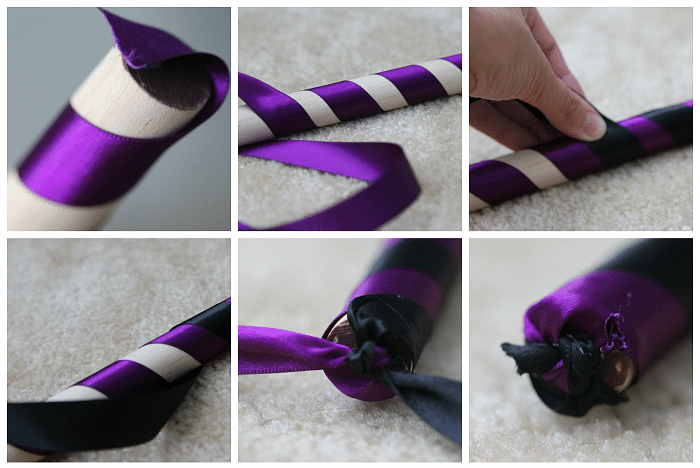 Make sure you leave about 1/2 inch of space between the twirl, which is where your other ribbon will go. If you make it larger you will have a hard time covering your other ribbon. Once the first color is wrapped and secured on both ends, begin your second color. 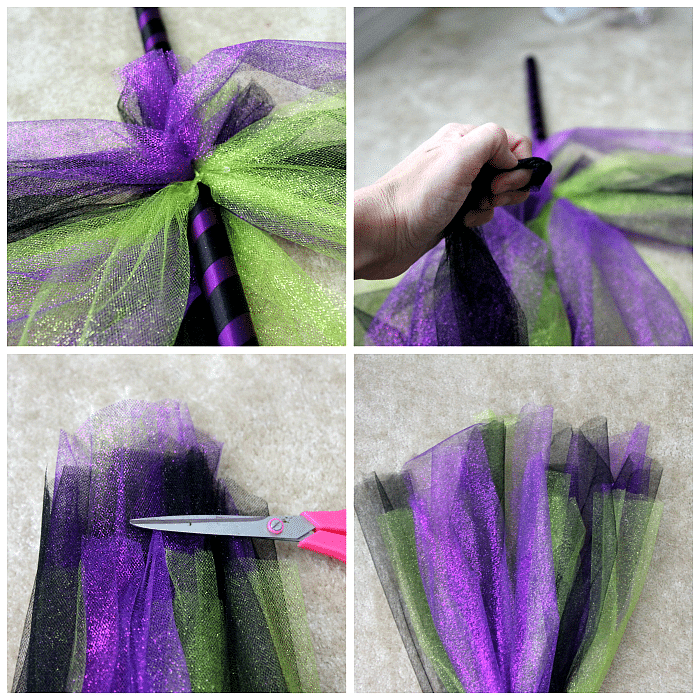 STEP 2: Now you need to measure your tulle out for the end. I know that 100 people are going to ask me the EXACT length, but you will need to eye your own broom. The reason is because the length of the end will depend on the length of your dowel and your childs height. When I made my witches broom, I measured a few inches PAST the length of the dowel. All in all my measurements were approximately 3.5 feet of tulle that I then folded in half and tied at the top, leaving just a bit above in a loop. 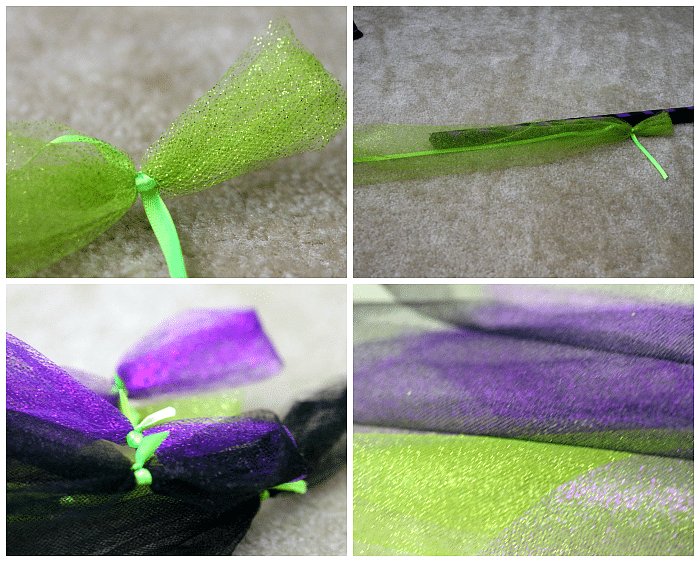 I created all my tulle pieces before moving on and needed approx 9 of them (3 of each color) to complete around my dowel. Please note: In a REAL broom there would not be a dowel/handle running down in the middle of the “broom” part… I do not own a saw to trim my dowel, but if you do, you can trim your dowel to a better length prior to beginning your project. Step 3: Alternating colors, I hot clued at the ribbon area around the dowel. Once on the handle, I snipped the loops. 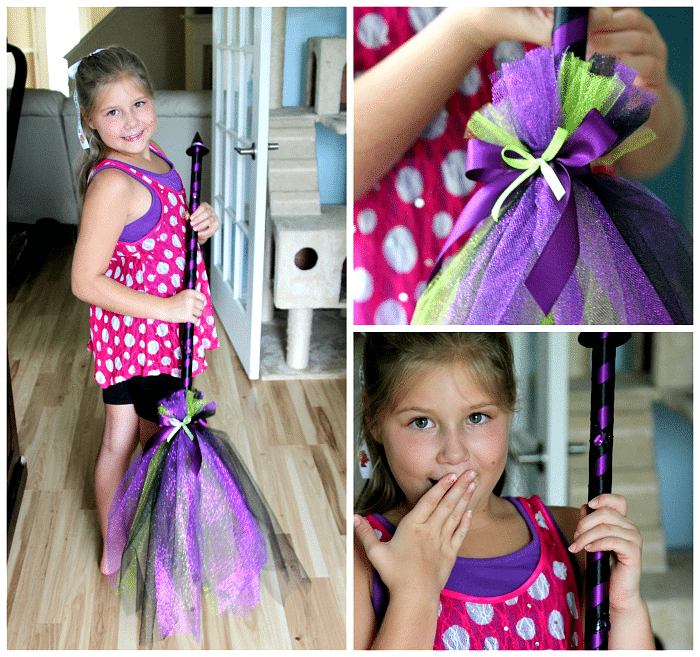 Step 4: By now your broom should be LOOKING like a broom! The rest is detailed work. First, I noticed that I could use some extra tulle around the end, so I parted my tulle and twisted a few individual pieces to “fluff up” the bottom by hot gluing them underneath. 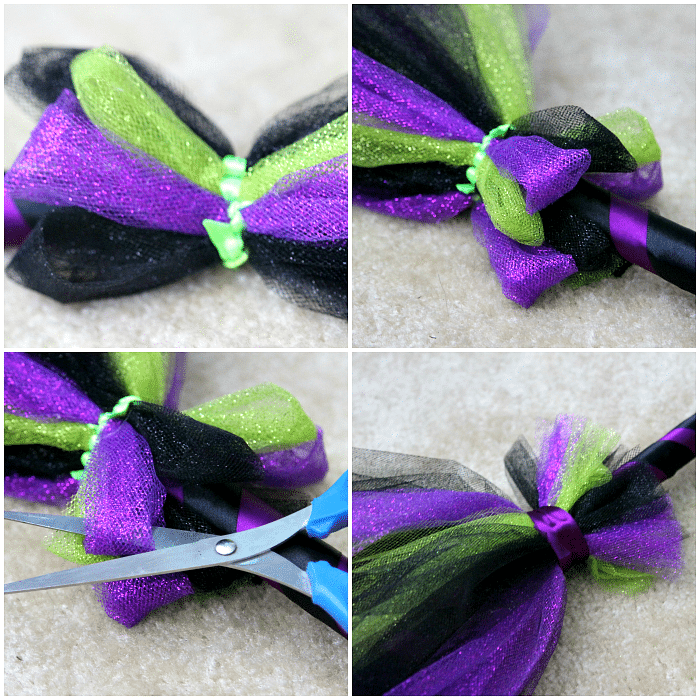 I also decided to take some of my left over ribbon and secure it around the middle of the broom and add on a cute bow. I also added some sparkling spiders and a witches hat to the handle. In the end, the results were so cute! You can alternate sizes to make an adorable wall hanging decoration, front door greeter, or for a costume this Halloween. Yay! So happy you had good results. Love to see it! Thankyou I am so flattered!! Thanks for the wonderful link and way to share our work. OMG! That broom is too cute! I love the colors! Thanks for sharing at Submarine Sunday!! Perfect, just what I was looking for. I am using real tree branches from “haunted forest” for me and my little witches to match their tulle witches costumes (also DYI). Thanks so much!!! Hi! Was wondering what your dressing like if your little witches are tulle costumes? What a wonderful idea!! I cannot find a witch broom anywhere to go with my daughters costume, she is going to LOVE this….and when she out grows it, it will make great door decor for Halloween!! Great Job! I love the little hat topper. What an adorable little witch! The costume is very nice and I enjoy the combination of purple and black colors. It is a great idea for the Halloween which is coming closer and my daughter is already asking me to make a special costume for her. This is a cleaver and cute idea. I like you rendition much better then the store one!! 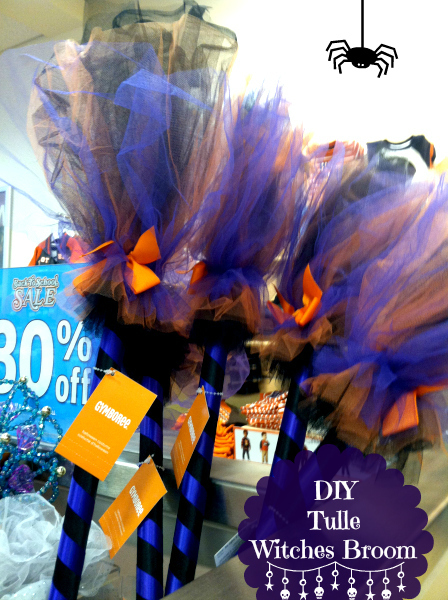 I wish I could work with tule. I always make a nightmare of a mess with it! I am starting costumes this week and my daughter was asking for a princess but after seeing this I may try to push for a witch instead. Great job! Can’t believe Halloween season is coming soon! Very cute DIY idea! Oh how fun is this? I am going to get the supplies and let my daughter help me make this. Super cute idea! How cute. In fact, your daughter is just too cute to be a witch. Maybe a Gretel (as in Hansel and Gretel). So. Stinking. Cute! 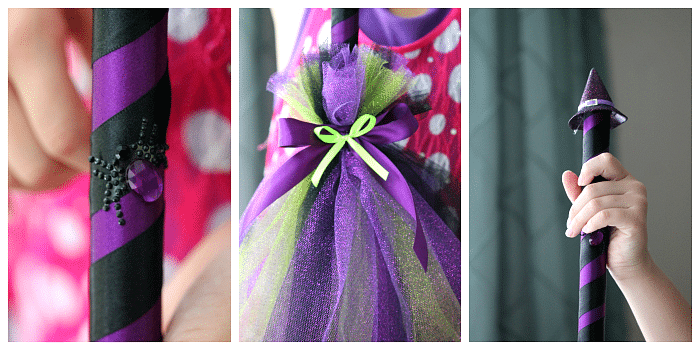 I’m trying to resist Halloween since it’s still 100 degrees here, but not much longer with this so cute DIY! Zeva would love this with a passion. I’m going to have to remember to do this for her this year. Thanks for the step by step directions. Love the color choices too. I love this. My daughters would both love one. I love Charlotte’s dress!! You are so creative! And your model is so pretty! Oh this looks way cool. So nice to be crafty. I like the colors you chose your hers also. OK, this tulle makes me wishing for a girl… probably not! what a great tutorial!! I have nieces so I can make these for them! I bought Abby one of those brooms and the handle broke. I need to break out my crafty self and make her one. I am not ready for fall, nonetheless Halloween 🙂 My niece is going to be a witch this year so I’ll share this with my SIL. Charlotte looks adorable in her costume. This is so cute. I wish I was crafty. Mine surely wouldn’t look that good. Adorable and Charlotte’s expression is priceless. I’m thinking something like this for the front door would be perfect for Halloween. Oh my gosh – that is fantastic! I totally want to make one in oranges and browns with pumpkins for fall/Thanksgiving décor! 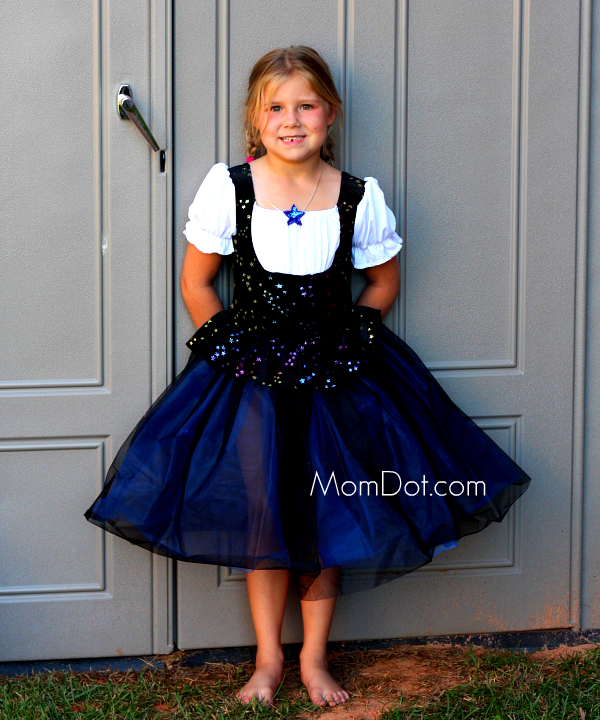 OMG that is so darn cute, and I love the sparkly tulle! The cat I had loved to eat tulle. We never would have been able to let him around it. That is super cute. 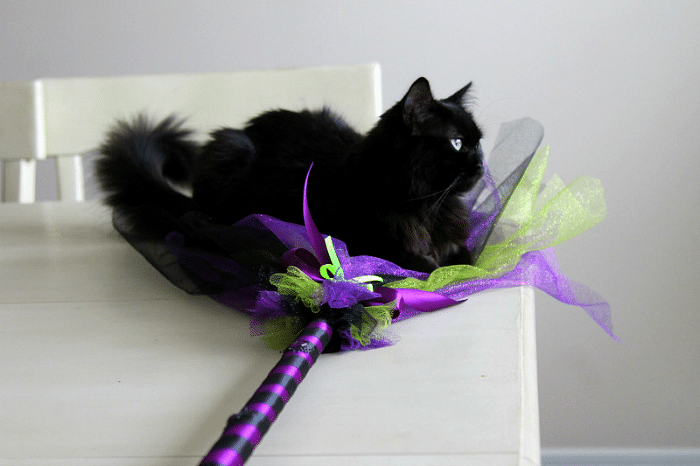 We don’t do witche costumes at our house but I love the broom, Charlotte’s expression, and your cat. That last picture is so Halloween! Oh how adorable….love Charlotte’s facial expressions and the black cat.